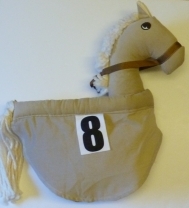 My Horse Gallops into Schools and Nurseries, bringing fun to numeracy learning and imaginative play! My Horse fulfills numeracy and imaginative play requirements in the National Framework for Early Years. 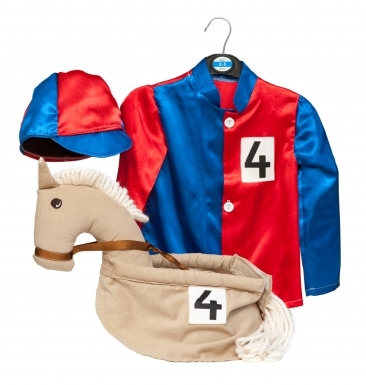 Our race horse adds a fun element to numeracy learning as children recognise, order and match numbers on horses and jockey jackets. We can add and screenprint colours, shapes and other required elements to our products. 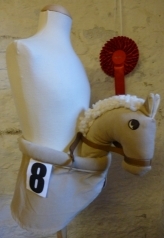 My Horse was first trialled in Guiseley Infant School in April 2011. It is still used there today to the delight of children in the younger end of the school, adding a unique aspect to their imaginative play. It has proven itself a durable, fun and safe resource. The number of schools and nurseries adding My Horse to their teaching resources is increasing. 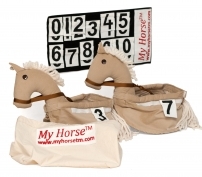 With the addition of the numbered race horse to the ever-growing range of products in the My Horse range, its potential as a numeracy resource has emerged. It is often used for number recognition, ordering and games as well as for sports days. You can request particular sequencial numbers, letters, symbols or other features. Each horse costs just £15.99 when you order 5 or fewer (ordering more than 5 horses reduces the cost to £12.99 each). 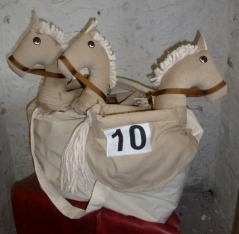 You can buy a calico bag containing 5 small race horses for just £80 (£90 for medium size), 10 small race horses for just £130 (£140 for medium size), or a bag containing 20 small race horses for £255 (£270 medium size). 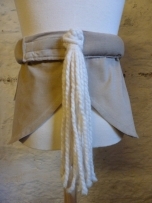 Bags of large race horses and other styles are available by special order.